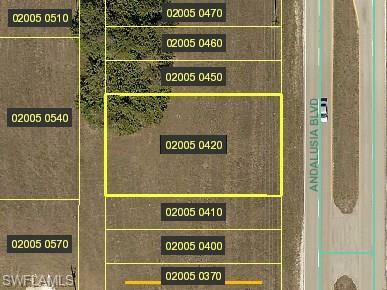 Get into this growing area of commercial on Pine Island Rd for a minimal investment. Zoned "Corridor" (see City of Cape Coral for corridor codes). 75' of Frontage on the West side of Andalusia just 153' South of Tropicana Parkway East with rear alley access (when completed). Listing courtesy of Craig Scott Young of Coldwell Banker Residential Re.